Roulette game appeared nearly two hundred years ago. If you want to play roulette game you are highly recommended to acquaint yourself with the main rules of the game and roulette etiquette. So, let's find out about the roulette game. Firstly you shouldn't look strange at the all players in order not to excite the curiosity of casino management. The main aim of the roulette game is to guess the result of the ball spun around the wheel. Every roulette pocket has different color and precise number. There are two types of roulette bets: Inside and Outside roulette bets. Inside Roulette Bets are such bets which are the placed on the internal area of the roulette game table layout, where the player can put bets for every particular number. Outside Roulette Bets are such bets which are placed around the outside of the board lie. Moreover, you can acquaint yourself with the french bets in order to become a strong game competitor. Every roulette wheel contains either 37 or 38 slots which are also known as "pockets". Every slot is painted in red or black. Moreover, all slots except zero pocket is numbered from 1 to 36. The numbers of roulette wheel are placed randomly. The quantity of zero pockets depends on the wheel type. Some casinos prefer to use the wheel which has only one zero (0). This type of roulette wheel is called as the "European" or the "French Roulette Game". Some people think that it is better to play European Roulette because there are better chances to win. Another type of roulette wheel is American Roulette Wheel where are both single and double zero. 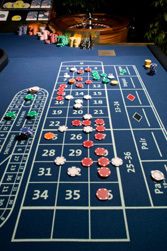 This type of roulette game can be found in Las Vegas and in many online casinos. In order to become the roulette expert and serious competitor you should learn the main rules of the game. Moreover, you should know main roulette cheating methods in order not to be deceived and avoid misunderstanding. Besides it is highly recommended to know the game etiquette. Remember when the croupier says "No more bets" you are not allowed to place them and it is no permitted to touch the chips. Try to be gentle with other players and don't smoke if the gamblers are non-smokers. Don't cry and speak loudly at the roulette table. Moreover, don't forget about the roulette tips which you may give to casino staff. You are welcomed to play roulette game either in land based gambling houses or in online casinos everything depends from your preferences.